As a kid, I felt the same way about plain yogurt as I did about white crayons: why do these things exist? Who would eat plain yogurt? Who would color with a white crayon? What kind of sick, twisted soul would find these things appealing? As an adult, I still feel the same way about the white crayon–Why does it exist? To color on black paper? Who has black paper?–but I’ve had a change of heart about plain yogurt. Especially now that I’ve discovered plain Greek yogurt, which is thick and rich and, when paired with other flavors, very satisfying as an afternoon snack. Plain yogurt, in a way, is a blank canvas: I’ve decorated that canvas with strawberries and blueberries, I’ve whirred it in a blender with orange juice and a banana and frozen berries and honey to make a smoothie, and, most recently, I’ve topped it with four ingredients that are like the Trylon and Perisphere of yogurt toppings. 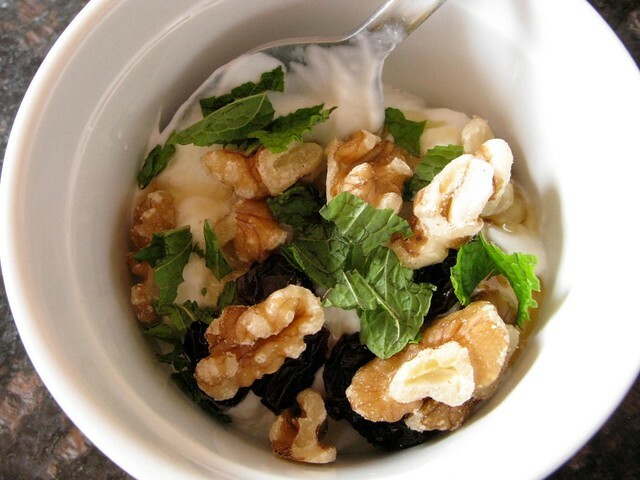 These yogurt toppings are the ones in the title: walnuts, raisins, honey and mint. The walnuts and raisins I just happened to have on hand (those are always good to have in your cabinet); the honey came from the farmer’s market (the best place to buy honey, in my opinion) and the mint was there, the first time, from a mint sauce I’d made a few days earlier for that leg of lamb I roasted. The mint was the only part I wasn’t certain about: of course walnuts and raisins and honey go well together, but mint? Turns out the fresh mint adds a lovely herbal note to the whole proceeding. In fact, I enjoy the mint so much with this I now buy mint for this very purpose. That’s dedication to mint.